The much-publicized announcement by United Parcel Service (UPS) last week that it will need to hire 25,000 new employees over the next five years to replace retiring baby boomers raises the specter of similar staffing issues to come for a number of employers. As odd as it may seem to be concerned about jobs going unfilled at a time when unemployment is nearly 10%, experts suggest that in some industries, employees may soon begin retiring at a much faster rate than they can effectively be replaced, a situation which could endanger corporate profitability. Where those new workers will come from and the cost of training them are employers' two top concerns. Research by economist Barry Bluestone, dean of the School of Public Policy and Urban Affairs at Northeastern University, predicts labor shortages over the next eight years to the tune of more than 5 million job vacancies, including 2.4 million in the education, health care, government and nonprofit sectors. "If the baby boom generation retires from the labor force at the same rate and age as current older workers, the baby bust generation that follows will likely be too small to fill many of the projected new jobs," says Bluestone's report, After the Recovery: Help Needed - The Coming Labor Shortage and How People in Encore Careers Can Help Solve It. The key issue for employers is: Are there enough workers in the pipeline who are trained and ready to step in when the baby boomers retire? Bluestone points out that even the manufacturing industry, which has lost millions of jobs over the last decade, is projecting 100,000 job openings over the next decade -- many of them due to retiring workers. When those workers leave, their skills often leave with them -- and that could ultimately hurt the productivity of many companies. Due to technological advancements, Bluestone said manufacturing jobs have become much more technical and skilled labor than they've ever been. Yet the misperception is that such jobs are "dirty" and "physically challenging," so many young people don't pursue manufacturing careers anymore. "In fact, advanced manufacturing is highly sophisticated stuff, and quite clean and modern," said Bluestone. But finding enough willing workers won't be the only challenge of dealing with the baby boomers' exit from the work force. Once candidates apply, the question becomes: Can they do the jobs? As The Wall Street Journal reported last week, the high failure rate of candidates trying out for UPS driving jobs is also posing problems for the company. 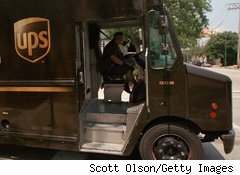 UPS was forced to adjust its training to include computer simulations and an obstacle course in an effort to improve a 30% failure rate among its applicants -- adjustments not all companies could afford to make in a struggling economy. Training for manufacturing and other skilled labor is expensive, so small- and medium-sized companies will think hard about incurring the cost of training a worker who may jump to another company after a few years. Auto parts manufacturers have experienced that scenario countless times over the years. "The higher the training costs, the more you will need to retain your current labor force," says Bluestone. That may mean retaining older workers longer by making their jobs more attractive to them. Labor experts suggest that more baby boomers will want to keep working longer than previous generations as they reassess their plans for retirement, so more are likely to welcome the opportunity to stay on. "In some cases, older workers are going to want to work part time rather than full time, or workers may want more flex time," Bluestone said. Positions may also need to be restructured through the use of technology or other means, "so that jobs that might have required more physical effort, require less physical effort," to compensate for the older age of employees. Bluestone also expects many employers will opt to allow older workers to retire, then hire them back as part-time contract workers until they can find permanent replacements. To stay competitive, companies will have to consider some or all of these measures if too many boomers leave the workforce at once. "In the old days, you wanted to get rid of your older workers as quickly as you could, because they were better paid and they probably weren't as quick as the young 21-year-old," said Bluestone "We might see the exact reverse if we don't have the right training -- firms begging their older workers not to retire but to stay on the job because they are fearful that they can't find equivalent replacements."